Nissan Grand Livina is among the two 7-seaters MPVs that the company offers in Malaysia. It is more affordable as it has a starting price of RM 82,195. It looks like a family MPV. The attractive elements at the front include large headlamps and stylish chrome grille. The rear gets a two-piece combination tail light. The interior of the Grand Livina offers a large and spacious cabin with folding seats for accommodating all your luggage. There are two engine options to pick from - a 1.6-litre 4-cylinder engine with 105 PS and 150 Nm mated to either a 5-speed manual or a 4-speed automatic gearbox. The 1.8-litre 4-cylinder engine which produces 126 PS and 174 Nm and comes only with the automatic transmission. In terms of safety features, you get ABS, EBD, BA, and reverse parking sensors. There are three variants of the Grand Livina available in four color options. Have a question on Grand Livina? Grand Livina is available in 4 different colors - Bronze Gold, Brilliant White, Tungsten Silver and Diamond Black. Watch latest video reviews of Nissan Grand Livina to know about its interiors, exteriors, performance, mileage and more. There was a time in the first decade of 21st century when the market for compact MPVs was at an all-time high. Seeing the instant rise in the sales of such vehicles, Nissan too jumped in the bandwagon and showcased its premium compact MPV, the Grand Livina. For the first time in 2006, the South East Asian countries were being targeted as the primary markets. With its slightly overhung body translating into more interior room, the Grand Livina became a success story. It provided all the benefits of an MPV, but with a shorter carpet area. 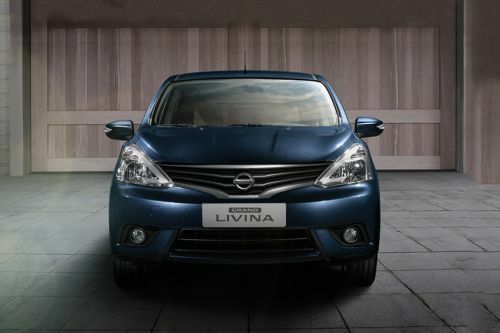 In the Malaysian market, the Grand Livina is being offered with a choice of two petrol engines with two transmission options and a host of five colors – Graphite Blue, Bronze Gold, Diamond Black, Tungsten Silver, and Brilliant White. On the inside, the Nissan Grand Livina doesn’t generate any wow factor, with its aspect of simplicity written all over the cabin. However, the dual tone black and beige theme for the cabin somehow tries to lift up the ambience. The three-spoke steering wheel with silver elements as well as the buttons mounted on it for audio and telephony are from the Nissan Almera. Also, the same goes for the dual pod instrument console with digital MID screen in between the analogue dials. The long, vertical centre console looks broad and slightly premium thanks to the presence of thick wood-like garnish around it. A full silver finish for the music system and AC controls looks good too. However, the overuse of wood and silver elements might not appeal to some. The 2-Din music system as well as manual controls for the AC look very simple and could have designed in a more modern way. In terms of features, the Nissan Grand Livina lacks many modern features which one takes for granted in similarly priced sedans and SUVs. However, where the Grand Livina clearly blows you over is its generous amount of space on offer, with all the three rows providing you oodles of room to seat with ease. In terms of design and looks, the Nissan Grand Livina doesn’t break any new grounds. It is designed in the same manner as most of the conventional MPVs are crafted. The overall design has a clear focus on functionality and form, which is why it might not appeal to the eye in the first impression stages. Starting from the front, the Nissan Grand Livina comes with a shorter bonnet, which complements with equally sloping large chrome grille with three distinct chrome slats. These chrome slats blend in towards the large triangular headlamps. The grille tapers down towards the centre, which makes the front grille look slightly visually better. From the sides, the boxy stance of the Grand Livina becomes more apparent, with the MPV having a long wheelbase. The large glass areas are designed in a somewhat old-fashioned way, with almost no character lines in the side profile making it look a bit bland. However, the rear view mirrors look aesthetically good with turn indicators mounted on them, which is the only modern bit we can find in the exterior design. At the rear, the Nissan Grand Livina looks a bit bland and empty because of the absence of any character chrome element or any other lines. The large trapezoidal tail lamps which extend toward the centre of the boot lid somehow try to complete the rear profile of the car. Being a large and boxy MPV, the Nissan Grand Livina is not a driver's delight and has a considerable amount of body roll as well. However, the independent MacPherson struts with stabilizer bar at the front and torsion beam type at the rear are tuned on a softer side, which contributes to the overall ride comfort. The ample amount of space for all the three rows means that long drives in the Grand Livina are a piece of cake. With minimal tiredness, it successfully complements its motive of being a functional MPV. The 15-inch wheels are a bit smaller for a vehicle of this size, and we would have loved to see at least 16-inch units on this car. For the Malaysian market, Nissan has made the Grand Livina available with two engine options, both of which are petrol powered. Talking about the smaller engine option first, the 1.6-litre,four-cylinder motor produces 105 PS of power and 153 Nm of torque. Meanwhile, the bigger engine is a 1.8-litre four-cylinder unit, which makes 126 PS of power and 178 Nm of torque. While the smaller 1.6-litre unit comes with the options of a 5-speed manual and a 4-speed automatic gearbox. The bigger 1.8 litre engine comes only with the 4-speed automatic gearbox as standard. Given the fact that it’s a basic entry level compact MPV, don’t expect the Nissan Grand Livina to be fully loaded with all the modern safety functions. The Grand Livina comes equipped with only the basic safety features such as dual front airbags, ABS with EBD, and Brake Assist system. The lack of modern safety equipment is quite understandable, considering the fact that it targets at a price-conscious segment. When it comes to desirability, the Nissan Grand Livina surely lacks a lot of it. The reason behind this is pretty clear – the vehicle looks drab on the outside, it looks outdated from the inside and the list of comfort as well as safety features is nothing to write about. However, where it does excel clearly are the areas where the MPVs are meant to be, and that is overall comfort levels. With ample amount of space and supple ride quality, the Nissan Grand Livina is clearly a winner, if only that features matters you the most. it’s pretty good car and looks decent too. What are the Safety Features Available in Nissan Grand Livina?